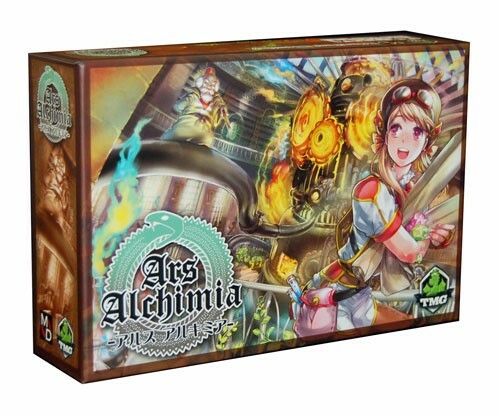 Ars Alchimia is a game by Kuro, published by Tasty Minstrel Games. It is for 2-4 players. In this game, players take on the role of overseers at an alchemical factory. They will be gathering orders, collecting resources and transmute them into new forms. Of course their opponents will be trying to do the same thing, just more efficiently than them. In the end, the player that can collect the most points from creating the rarest items and elements will be declared the winner. To begin, the board should be placed in the middle of the play area. The Transmutation Forges are shuffled together and placed face down onto the Transmutation deck spot marked with the potion icon. 1 Forge card is dealt face up onto each empty space with a potion icon on it beside the deck. The Assistant cards are shuffled together and placed face down next to the board. 1 Assistant card is dealt face up onto each spot marked with a people icon on it. For games with less than 4 players, only 2 spaces will be used. The Location cards are shuffled together and placed face down on to the Gathering deck spot marked with the compass icon. 1 Location card is dealt face up onto each empty space marked with the compass icon on it beside the deck. For games with 2 players, only 2 of the spaces will be used. Each player chooses a color and is given a set of workers of their chosen color and a corresponding scoring disc. If there are less than 4 players, each player returns 2 of their workers to the box, not to be used during the game. Players then take 9 of their workers and set them in front of themselves. The remaining workers are set aside in the box lid to be acquired during the game. The scoring disc is placed next to the 1 space on the edge of the board. The factory cards are shuffled and randomly dealt out to each player. The 4 card is not used when playing with 3 players and the 3 card is also not used if playing with only 2 players. This determines the first player. The die is then given to the player with the 1 card. The Order cards are separated into 3 different stacks based on their ranks. Each stack is then shuffled separately. 3 Rank C cards, 2 Rank B and 1 Rank A card are dealt onto the corresponding colored spaces marked with the scroll icon. If there are only 2 players, one of the Rank B spaces is left empty. Each player is then given a player mat and a colored cube that corresponds with each of the 5 elements on the mat. Each cube is placed on the corresponding colored track on the 0 space. Play now begins. The game is played over a series of 4 rounds that represent 1 year. Each round is made up of 3 phases; start of round, main step and end of round. The first phase is the start of round. In this phase, the playing order is determined via the Factory cards. In the first round, this has already been done. From the second round on, the player with the least amount of points gets to choose from the Factory cards first, followed by the next lowest points and so on. Once this is done, players gain workers from the box lid equal to the number on their Factory card. Players will then pay any upkeep for assistants they have from a previous round. This is done by placing a worker on the Town Square for each assistant they want to keep. Players also have the option of returning the assistant to the bottom of the deck if they don’t wish to pay the upkeep cost. The next phase is the main step phase. In this phase, players will take turns placing workers, beginning with the lowest Factory card number and continuing to the highest. The player is then able to place one of their workers in one of the rectangle boxes beside one of the cards on the board. The player must place as many workers as there are already in the box + 1. In other words, if there is already a worker in the box, the player would have to place 2 workers. The player then moves any previous workers to the town square. It’s also possible to place more workers than is required, for some places this will earn the player a benefit. The action from the spot is then resolved based on the card. Once the action is resolved, the player hands the die to the next player. This continues until players run out of workers or chose not to place any more. The player then passes. There are several actions that are available for workers to do. They can gather resources. This is done by visiting one of the locations. This can also include the face down deck. To use the deck, the player flips over the top card then once the action is completed, it’s returned to the bottom of the deck. The player gains the resources indicated by the card and adjusts the cubes on their player mat accordingly. They then roll the die and if the number is rolled is equal to or higher than the indicated number, the player also gains the bonus resource. The player can gain +1 to their die roll by placing 1 more worker than was required to place on the location. Another action a player can do is to take up orders. To do this the player takes the chosen card and places it on an empty card slot on their player mat. A new card is then drawn from the corresponding deck to replace it with. Players are only allowed to take orders of Rank C until they have fulfilled 1 Academic order. This then allows them to use Rank B orders. Once they fulfill another Academic order they are then allowed to take Rank A orders. Once the fourth and final round is reached, players are allowed to take any rank orders, regardless of their academic rank. Players are only allowed to have 3 orders at a time. Yet another action that’s available to do is to employ assistants. To do this, the player takes the card and places it beside their player mat. The top card of the deck is then drawn to replace the taken card. The effect of the assistant is applied immediately. Some assistants only allow for effects to happen once per round. For these assistants, the card is turned sideways to show that the effect has been used. Transmuting is another action that can be taken. The player is able to use one of the face up forges to create elixirs or complete orders with. They can also use the face down deck just like using the location deck. To use the deck, the player flips over the top card then once the action is completed, it’s returned to the bottom of the deck. The player rolls the die to see if they can gain bonus points by rolling equal to or higher than the number indicated on the card. Each transmutation done during the turn then gains bonus points for the player. Just like if they were gathering resources, the player can place more workers to add 1 to the die roll. The player may transmute as many times as the forge has transmute symbols. Fulfilling an order is done by adjusting the cubes on their player mat that correspond with one of the orders the player has on their player mat. Elixirs may be used as any resource. Once the order is completed, it is set aside and the player gains points equal to the card. Bonus points are awarded if the die roll succeeded and based on the rank of the order. Transmuting an elixir is done by taking 2 different resources and creating an elixir. The die is rolled and if the roll succeeds, the player gains an extra point as a bonus. The final phase is the end of round phase. This phase begins once all players have passed from the last round. Three steps are then followed. First, all the workers on the board are returned to their respective owners. Next, any assistants that have been used and turned sideways are now refreshed and returned to their upright position. Finally, all the face up cards on the board are shuffled separately by type and then returned face down to the bottom of their respective decks. New cards are then drawn to fill up the board just like during setup. The game continues until the end of the fourth round. Once the round is over, players compare scores. Any player with unfulfilled orders loses points equal to half the order’s point value. Players then gain bonus points for how many of each type they fulfilled. They also gain a point for each elixir and one for each assistant they have. Points are added up and the player with the most points is the winner. This game comes in a rather small and compact box. Even so, it’s got lots of pieces with it. There are lots of wooden pieces here. There are the worker pawns in four different bright colors. There are the 5 different colored cubes for each player’s mat. Finally there’s the 4 different colored player scoring discs. I really like the bright colors on each of these and the quality is really great. The die that comes with the game is a bit small. I’d have like a bigger die but it’s just a die and this one gets the job done fine. Next we have the player mats. These look nice and fit the them nicely but they’re just a bit thin. I’d have liked thick cardboard instead of these. The cards are the smaller Euro size but the quality of these is really great. I really like the artwork and design. They fit nicely with the theme and look of the game. The art reminds me of Final Fantasy Tactics in the assistant designs especially. Not sure why the Japanese text was left on the cards as it does tend to take up a bit of room on them, making the English text even smaller. However this is only a very minor irritation on an otherwise nice design. The board itself is beautiful. I really love the art chosen for it. It looks like a lovely place I’d like to live. I have to say that even though there are a few minor quirks here, I really like the overall look and feel of the components. They all look really great. The rulebook for this one is a bit odd. I’m not really sure what happened here. The book is only 4 pages long, but the front cover is actually the last page. The inside 2 pages are the cover and the 1st page. The back cover is the third page. I’m guessing the printing machine went a bit screwy. There are only a couple of pictures in the book and these are kind of small, but nothing really to worry about. The setup and components are lumped in together so there’s no real coherent thought on getting the game ready to play. Some things aren’t even mentioned, like the player mats and the resource cubes. Some things like the scoring discs aren’t referenced correctly, being called point cubes. Huh? Thankfully the rules are only 4 pages and small enough that it’s not hard finding what you’re looking for. I will say that for the most part, each phase is detailed fairly well. I didn’t find a lot that was confusing or too difficult to figure out. Overall the rules do look kind of odd and feel rather weird, but it gets the job done despite the major issues here. Maybe just a little better quality control and translation job could have made this not such a mess. Still, it gets a passing grade despite the flaws. This is a light and fun game. I really like worker placement games and this one takes hold of the mechanic and runs with it. There are always plenty of choices to make and lots of things that you can do on your turn. I especially like the addition of the die roll when you do certain actions to gain extra benefits. The game can be rather strategic as you choose which orders you want to try and complete. Of course you have to be careful that you don’t overload yourself and wind up with negative points during scoring because you couldn’t complete the order. The way that workers are placed in this game reminds me of the game, Coal Baron. Each time that you decide to place a worker you have to think about the cost. If the space is empty it’s pretty simple to just place a worker and move on. As the round progresses, you have to consider how badly you want to make a certain move as you may end up having to pay a lot of workers just to do the action. I really like this game the most with 2 players. More players are fine but each action tends to cost a bit more and it’s a little harder to get things done. Of course that’s kind of the idea. As a 2 player game, in my opinion, the game is at it’s best. You’re able to do stuff but there’s still a bit of competition for certain spaces. Fans of worker placement games like Coal Baron or Lords of Waterdeep should enjoy this one fairly well. It’s a game that I recommend especially with 2 players. Overall, I think most people will enjoy it. 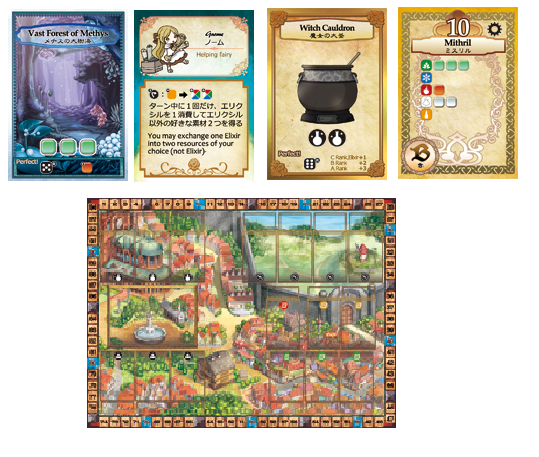 Ars Alchimia is a worker placement game about alchemy. It’s not an extremely long game. Most game sessions last a little over an hour. The game plays great with all number of players but for me it shines with just 2. The artwork is really nice. I especially like the designs on the cards, which remind me of Final Fantasy Tactics. However the text is a bit small due to the japanese text included on the cards. I also would have like a bigger die and thicker player mats. The rulebook seems to be the largest issue with the game as the lay out is completely messed up and there are some glaring mistakes and omissions throughout the small 4 page book. Thankfully the game play is fun making it fairly easy to overlook the minor issues. Fans of worker placement games like Lords of Waterdeep and especially Coal Baron, which has similar mechanics, should really enjoy this one. I recommend this game, especially as a 2 player. Now if I could just figure out how to turn lead into gold. This entry was posted in Reviews and tagged alchimia, ars, ars alchimia, board, board games, card, card games, games, kuro, minstrel, tasty, tasty minstrel, tasty minstrel games. Bookmark the permalink.